because FancyToolTip will parse “title” attribute to “fancytooltip” attribute, so this plugin will not work. Goston, I understand. But the link creation dialog on the post editor won’t give you an easy way to put controls. Using the rel attribute you’ll have to manually edit the HTML. To have a single strong plugin, I propose to add an option to the admin dialog to let the user choose wether to use title or rel attribute. I’ll accept a patch from you to implement it, or I can do it in a few days. ijliao, how it exactly fails ? If user can choose title or rel attribute will be great! <a href="url" rel="googlemap">xxxx</a> for the user. Goston, check the plugin code. Look for a function called googlemaps_optionsSubpanel(). Change the HTML code there to include a checkbox, and follow the examples there to see how to save the option on the DB. If you can send me an update, I’ll review it and release a new version. Tell me more about this quicktag.js file. Did you change it directly on WP source code, or is it possible to make in a more modular way, in a plugin level ? I have had send a update version to you. I add a button on post editor named “Google Maps”, press the button give it url and location description then all code will be generate. It doesn’t appear to be working either on this page, or on my test site – I was using macdiggs version 2.0 earlier today and upgraded to 2.1 when it didn’t seem to be working (map not showing on his page either) and now I am using your version 3.1. Maybe Google have changed their API without notice? Thanks for neatening it up. Cool. Upekshapriya, did you use the correct API key for your site ? 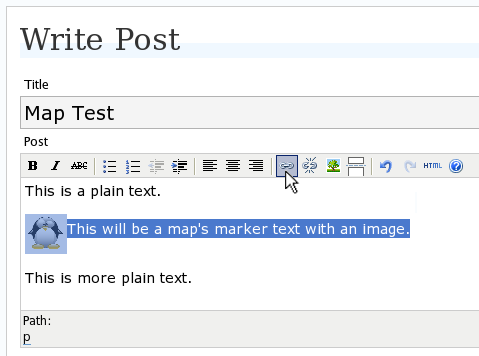 Do you have a post with a map on your blog so I can see it failing ? What a weird combination of circumstances! extension installed in Firefox and had forgotten to enable your site! 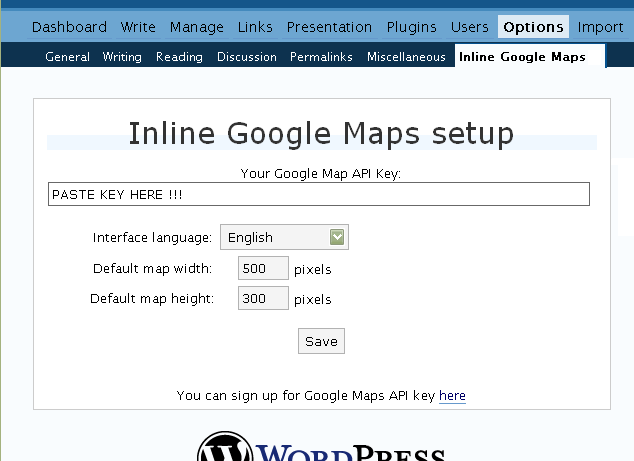 which was the last plugin I remember installing – I deactivate it and hey presto the inline Google Map appears again! Well that is interesting to find out. Hey, thanks, and it works great! Is there any easy way to get the default “Directiond to here / from here” behavior in the bubble? Holmes, I’m sure there is, but I’m affraid not with this simple plugin. unfortunately this does not seem to work with my blog. Could you please have a short look? Nick, you are using rel=”googlemap” buth have disabled the use of the rel attribute. 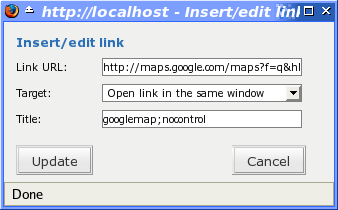 Either enable it in the admin interface or make your link have a title=”googlemap”. Hartmut, everything seems correct in your page. Don’t know why its not working. I think a cool feature would be to select or somehow only have the code show up on certain pages, that way everyime every single page loads its not waiting for the google maps server to respond. I retested it with an US link (instead of Switzerland) and it worked!? Is anyone else having a problem with the google maps being shown in Firefox? It looks great in IE, but won’t show up in Firefox. Am I missing something? Pingback: Club Motard - Trankis BCN » Podremos poner direcciones y que salga el mapa? Joyce, interesting. I just discovered a bug in the plugin, but you can work around it easily. The plugin will not work with the defult map that appears when you just enters the Google Maps website – and this is the map you re using for testing. I’ll try to fix that in near future. Just go to Google Maps website, move the map a little bit, or go to a specific location you want and copy the link as described by the instructions. I debugged your page. Everything else is OK. It will work. I’m trying to use your plugin and not having success. I’ve looked at the problems that others have had and tried to solve it myself, but I still seem to be doing something wrong. One thing that stopped it working for me which I fixed is not having in my header template. must always appear before the tag for this plugin to work. Avi, this looks like a great plugin, and I am impressed how it works when it works, but I am having the same problem as some of your other users below: it’s just not working! Please take a look at my test page and let me know if you see what I may be doing wrong. Sean, I debugged your page but couldn’t see anything wrong. Maybe your API key is bad ? Maybe you use some other plugin that also manipulates link attributes? Try to deactivte them for a while. Maybe you should try using the rel attribute instead of the title. Check the page for details. Misty, your problem is the Snap plugin. Google Maps and Snap both manipulate links attributes. Try to not deactivate Snap but configure Google Maps plugin to use the “rel” attribute instead of the “title” attrib. Instructions on the page. Otherwise you’ll have to deactivate Snap to see maps being rendered. Thanks so much for the quick response. I tried using the rel command and that didn’t seem to work either. It must be the Snap plugin like you said, but now I have to decide which one I want more. Thanks again for your help with this. Avi — Thanks for writing. I’ve tried everything you suggested. I used the rel attribute, generated a new API key, deactivated *all* of my other plugins, even switched themes, but the results are the same. The map simply doesn’t display. I appreciate the attention that you’ve already paid to this. I will just keep an eye on your site and watch for future updates. It looks *really* good when it works, so I look forward to resolving this in the future. Ok I have found a problem which will cause the map to show or not to show. When you click create link sometimes the link Google maps differ. One link will cause the map to show while another link will not. Both of these are the exact same street address. One shows and one doesn’t. Hone, I checked both links out and indeed I couldn’t see a difference. You should use Firefox, use the error console, clear it, and reload the page to see if you get some errors. I had given up on this plugin working at one point, but spent some time with it and I got it working. Let me explain what I did so that it may help solve other problems. I followed the instructions as written, but would always end up with a link in the post and NO map. I edited the html code for the link and replaced the beginning of the link all the way up to the “?”. 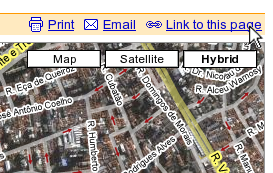 I changed it FROM: “http://www.google.com/maps?” TO: “http://maps.google.com/maps/geo?”. Then I saved the post. The next time I looked at the page, the link was replaced by the map.